Minnesota Historical Society Press, 9781681340388, 32pp. Sadie's younger brother, Benjamin, doesn't always know to be afraid, but big sister keeps an eye out for him and enumerates his concerns--which are really her own. The north woods comes alive in her imagination as she battles "monster boulders" and "growling waterfalls" and "flying dinosaurs." 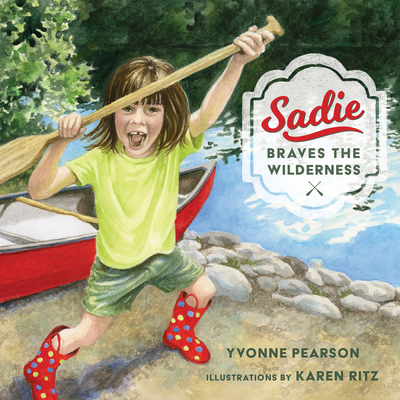 Sadie's spunky approach turns away these fierce foes as she and her family swim in quiet pools, hike twisting forest trails, and launch their canoe on a skinny lake. On the last day, a storm blows in, and Sadie is brave for Benjamin as the wind whips branches and rain beats on the lake--and her own fear disappears. In the end, there are a hundred new little rivers to play in. And Sadie just may be a convert to the appeal of exploring the wilderness.